Have you ever noticed how the great minds of human history are best known for one particular idea, despite having many others to their credit? They're often acknowledged for that one giant breakthrough, the massive leap forward in technology or scientific theory yet the plethora of their other ideas remains largely unknown to most of us. Einstein and his theory of relativity; Newton discovering Gravity; Darwin and Human Evolution; the Wright Brothers and the First Aeroplane; Alan Turing and Computers; all are great people who are regarded with a large amount of respect for each of these creations, yet they have so much more to offer if we would only look. Investigation into these people and their other ideas can be particularly enlightening, and the study of the Investment Masters is no different. Over the years, researching the great minds of investing I've found many common threads that define those outstanding investors with long term track records of success. Deconstructing the psychology and play books of these great investors forms the foundation of the Investment Masters Class Tutorials. Through reading autobiographies, annual letters, interviews and investment books by the Masters, I've found each of the Masters has either taught me a new insight or emphasised a concept or mindset that has helped me in my career navigating markets and advising institutional clients. I've spent my time reading and listening to their insights - which form the basis of the tutorials. There is no doubt that Warren Buffett and Charlie Munger have worked out most of the ingredients for successful investing. Every time I re-read a Buffett letter or interview, or one of Charlie's essays I pick up another nugget of wisdom. Notwithstanding, I've learnt a lot from many of the other Investment Masters: Soros can help you understand how asset bubbles form and why they collapse; Chanos can teach you why shorting stocks on low PE's might be more fruitful than shorting high flyers; Ed Wachenheim will teach you to look beyond the typical investors timeframe; Greenblatt can help you with spin-offs; Francois Rochon will keep you focused on your company's earnings rather than share price, while Ray Dalio will emphasise the value of studying history and learning from mistakes. Michael Steinhardt will put you on the path toward seeking the truth; while Thomas Russo will show the benefits that accrue to companies who invest for the future; accepting short term pain for long term gain. Interestingly, all of these Investment Masters have also learnt from other people. And they never stop; learning is endless. The day you decide that you know enough, or worse that you know it all, is the day to stop what you're doing and start again. "I’ve always found it interesting that most value investors like to read only about other value investors. If you ask any value investor about their investment hero, Warren Buffett will be on the top of their list. He is on top of our list too, but once you’ve read seven books on Buffett, is the eighth one going to add more value? Would not reading about somebody else, who did things very differently from you but who also succeeded tremendously, be more valuable? I find that I learnt a lot by reading about some of the hedge fund managers such as Michael Steinhardt, Paul Tudor Jones and George Soros, all of whose approach was very different from what ours is. Perhaps you may find one thing from their approach that is consistent with your own philosophy. One of the things that Michael Steinhardt famously relied on was variant perception. On every company he had a position in, he knew what the bulls and bears thought, and why his point of view was different. Sometimes, as value investors, we don’t spend enough time doing that. We assume that if a company has a low P/E, or a low price to book, that’s enough to conclude it’s cheap. But we’ve learnt by studying Steinhardt that we can add value in our process even in a stock that looks statistically cheap by stating our different and distinct point of view. Anybody at Oakmark will be able to tell you what our variant perception is of a stock that we own. 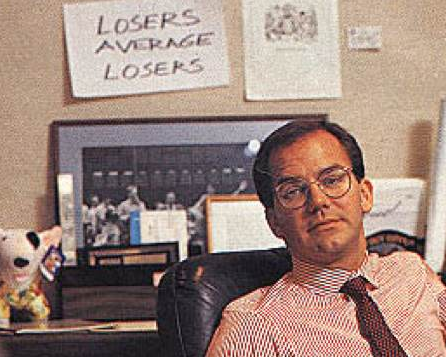 There is a famous picture of Paul Tudor Jones with a piece of paper on his bulletin board that says ‘Losers average losers’. As value investors, we always want to believe that the stock is overreacting to bad news. A typical analyst report goes: This is a disappointing quarter but my value estimate fell only 5% while the stock fell 15%, so it’s a lot cheaper than what it was yesterday. This led us to do a lot of research into our own ideas. When the fundamentals start deviating from what our analysts had projected, averaging down on those names tend to not work. It made us alter how we thought a little bit more, which for us is certainly more valuable than learning what Warren Buffett eats for breakfast. What Warren does — buying great businesses that are run by good people, buying and holding, thinking about long term — is still the core of our investment approach. Nothing pleases me more than when somebody says that what we do at Oakmark is very similar to Buffett. At the same time, that doesn’t mean we can’t learn from people who do things very differently from what we do." And learning from others is a privilege. Consider this; many of the greats and their discoveries were made after long years of trial and error, making mistakes and learning from them, starting from scratch a number of times before success came their way. By learning from others we can avoid the pain they went through and yet achieve success of our own. That's got to be a win-win scenario for everyone. I hope I never stop learning; the rich gifts these great people have bestowed upon us is immeasurably valuable. So what have you learnt today?